Now, however, I am obliged to speak more concretely about the events which took place at the beginning of our [Christian] era. I will speak of the events, the forces which live on in the aura of the earth, and which may be observed esoterically. Tomorrow I will speak of the reasons why now, in our times, these things must be revealed within our anthroposophical circles. Today I will try to indicate some of the things that occurred in Palestine at the beginning of our era. And I hope that in your hearts, in your souls, when the event of Golgotha, which [until now] has been characterized more in conceptual form, does not lose any of its significance if we look directly and concretely at what happened at that time. When we consider such an incarnation, we must be especially clear about one thing: that even when such an advanced individual, as Zarathustra certainly was, is again incarnated – namely in the time he was born as Jesus – in no way must he know in childhood or youth that he is that individual. It is not necessary to be able to say: I am this person or that person. That is not the case. It is, however, true that in such cases the enhanced capacities gained by having passed through such an incarnation become evident early and thus define the child's character. So it was that the Solomon Jesus child – as I would like to call him – in whom the I of Zarathustra lived, was endowed with enhanced capabilities which enabled him to easily absorb the culture and the knowledge to which his earthly contemporaries had attained. In that child's environment – especially in those times – existed the whole cultural civilization of humanity in words, gestures and deeds – in short, in all that could be seen and heard. A normal child absorbed little of what he saw and heard. This child, however, absorbed with great ease all the sparse indications in which existed everything humanity had achieved by then. In short, he proved himself to be greatly gifted at absorbing all the available scholarly knowledge. Today we would call such a child “highly gifted”. Up until his twelfth year he quickly learned everything to be learned in his environment. The other Jesus was completely different. His character is well reflected in the Gospel of Luke. He descended from the Nathan line of the House of David. He had no gift for scholarly learning, nor did he show interest in it up until his twelfth year. On the other hand, he showed to a high degree what we can call capacity of the heart, compassion for all human happiness and suffering. He showed himself to be especially capable in that he concentrated less on himself and was less able to attain exterior knowledge. But from earliest childhood on he felt the suffering and the joy of others as his own suffering and his own joy. He could transpose himself into the souls of others; he possessed this ability in the highest degree. The Akasha Record indicates that the differences between the two Jesus children could not have been greater. After both boys had reached their twelfth year, an event occurred which I have often characterized: that when the Nathan-Jesus traveled to Jerusalem with his parents, the I of Zarathustra, which had been in the other, the Solomon-Jesus, left his body and took possession of the Nathan Jesus's physical, etheric and astral bodies. The result was, therefore, that everything that this royal-I was capable of was now active in the soul of the other, the Nathan-Jesus child. And this boy, now possessing all of Zarathustra's power, without knowing it, caused astonishment in the scholars among whom he emerged teaching – as it is also described in the Bible. I have also indicated how the other, the Solomon-Jesus, from whom the I had departed, soon thereafter declined and, after a relatively short time, died. It must be understood that when the I of a person leaves him – as was the case with the Solomon-Jesus child – he does not necessarily die immediately. Just as a ball continues to roll on for a time under its own inertia, so does such a person continue to live on through the strength which lives within him. Now someone who cannot observe human souls in a precise way will notice little difference between a person who has lost his I and a person who still has one. Because in normal life the I in a person we are observing does not play such a dominant role. What we experience in another person is to a very small extent a direct manifestation of his I, but rather the manifestation of his I through the astral body. That other Jesus-child retained his astral body, however, and only someone who can carefully distinguish – and it is not easy – whether old habits and thoughts still continue to act in a person or whether new elements are present, can thereby determine if the I is still present or not. But a decline begins, a kind of dying out, a withering away. And such was the case with this Jesus boy. Then, through a stroke of karma, the biological mother of the Nathan-Jesus and also the father of the Solomon-Jesus died soon after the passing over of the Zarathustra-I from one boy to the other. And the father of the Nathan-Jesus and the mother of the Solomon-Jesus became a married couple. The Nathan-Jesus had no physical siblings, and the step-siblings whom he now acquired were the siblings of the Solomon-Jesus. From the two families one was formed, which henceforth resided in the town now called Nazareth – so that when we refer to the Nathan-Jesus, in whom the Zarathustra-I lived, we use the expression: Jesus of Nazareth. Today I would like to relate something about the life of Jesus of Nazareth as a youth – from research in the Akasha Record – in a way that enables you to understand a certain important moment in the earth's evolution which the Mystery of Golgotha had prepared. For a seer the life of Jesus can be clearly divided into three phases. The conversation with the scholars in his twelfth year had already shown that he possessed an inner capacity, provided by the passing over of the Zarathustra-I, to be enlightened, to receive enlightenment and to connect it with the capacities which lived in the soul of Zarathustra. It was shown that an enormous force of inner experience was in his soul, so that as he developed from his twelfth to his seventeenth and eighteenth years it can be seen how inner enlightenment became richer and richer, and especially enlightenment related to the evolution of the ancient Hebrews and the Hebrew people in general. At the time Jesus lived in the Hebrew people, the grandeur of what had existed as secrets of the cosmos during the times of the ancient prophets was no longer present. Many of the old revelations of the prophets lived on, but the original capacity to receive spiritual secrets directly from the spiritual world had faded out long before. They were studied from the preserved scriptures. There were still some, such as the famous Rabbi Hillel, who, because of his individual development was still able to perceive something of what the ancient prophets had proclaimed. But that force, which existed during the ancient epoch of the Hebrew people, the time of the prophetic revelations, was long since no longer present in those few individuals. A decline in the spiritual development of the Hebrew people was clearly apparent. Now, however, what had once been revealed during the time of the prophets emerged from the depths of Jesus of Nazareth's soul as inner enlightenment. But I wish to draw your attention less to the historical fact that in one person what had been revealed during the prophets' time appeared again by means of inner enlightenment. I would rather like to emphasize to you what it felt for such a relatively young soul – the soul of the thirteen to fourteen year old Jesus of Nazareth – to feel a revelation coming to him in total isolation, a revelation which no one else in his surroundings felt. At most the best of them perhaps had a dim glimmer of it. Try to imagine yourselves in such a position, in the soul of someone possessing such great knowledge alone, and understand that the Mystery of Golgotha had to be prepared by such feelings of loneliness and isolation taking possession of Jesus of Nazareth's soul. When you stand alone on a psychic island as he did, who from his childhood on had felt such solidarity with all men, but now did not feel that he could share his knowledge with them because they had sunken to a level where they could no longer receive the revelation. He suffered greatly having to know something which the others could not comprehend, but also wishing so strongly that it could also arise in their souls that a mission was being prepared. All that gave him the fundamental impulse to say: a voice resounds in me from the spiritual world. If humans could hear it, it would provide an infinite blessing for them. In olden times there were people who could hear it. Now, however, they have no ears with which to hear. That pain of solitude pressed ever deeper on his soul. Such was Jesus of Nazareth's inner life from his twelfth to his eighteenth year. For this reason he was not understood by his biological father and his stepmother, and even less so by his step-siblings, who often mocked him and considered him half mad. He worked hard in his father's carpentry. But while he was working the feelings I have just described lived on in his soul. Then, when he was around eighteen, he left home to travel. He went through Palestine and the surrounding pagan areas, working at his trade. He was led by his karma. As he wandered through Palestine his extraordinary character was seen by all the people he met. During the day he worked, evenings he sat together with the people. And the people with whom he sat from his nineteenth until around his twenty-fourth year had the feeling, although they were not always conscious of it, that he was an extraordinary individual, such a one as they had never encountered before; they could not even have imagined that such a one existed. They did not know what to make of him. If you wish to understand this, to penetrate into the secrets of human evolution, it is necessary to take into account that experiencing what the young Jesus of Nazareth did – as I have just described – causes deep sorrow in the soul. But this sorrow is transformed into love. And much deep love in life is transformed sorrow of this kind. Deep sorrow, pain, has the capacity to transform itself into love, which does not merely act like ordinary love, but through the very existence of the loving being streams out like far reaching auras. So those people who were together then with Jesus believed that they were in the presence of much more than a mere man. And when he had departed from a place and they sat together evenings, they had the sense of his real presence. They felt as though he were still there. And it happened more and more that the people with whom he had stayed, when they sat together around the table, had visions in common. They saw him enter as a spirit-figure. Each one had this vision at the same time, that Jesus was once again among them, that he spoke with them, told them things just as he had once done in physical form. He was visible among them long after he had left. What caused this effect was pain and sorrow transformed into love. The people with whom he was felt themselves to be united with him in a special way. They felt that they were never again separated from him. They felt that he remained with them and that he always returned. But he did not only travel around in Palestine, his karma also led him to pagan places. (It would take too long to describe here the reasons for his karma doing this.) This was after he had recognized the declining developments in Judaism. And he learned how in the religious rituals of the pagans, just as in Judaism, what was originally revelation had also died out. Thus in the second phase he had to experience the decline of humanity from a previous spiritual plateau. But he perceived how paganism declined differently than Judaism. His perception of Judaism's decline was a more inner experience, gained by enlightenment. He saw how the revelations from the spiritual world which were once proclaimed by the prophets had ceased because there were no longer ears to hear them. He learned about how it was with paganism in a place where the ancient pagan religious services had fallen into disrepair, and where the fall of paganism was physically evident. The inhabitants of the place had fallen victim to leprosy and other hideous diseases. Some had become malignant, others lame. The priests abandoned them and had fled. When Jesus was first seen, the news spread like wildfire that someone very special had arrived. For now even in his outer appearance he had achieved the transformed suffering which was love. They saw that a being had come like none who had ever walked on the earth. Soon the news spread and many came running to him, for they thought a priest had been sent to them who would again officiate at the sacrifices. Their own priests had fled – so they came running. The Akasha record shows this, just as I am describing it. He had no intention of officiating at the pagan sacrifice. However, he now saw in vivid imaginations the enigma of the decline of pagan spirituality. He could directly perceive what had flowed into the secrets of the pagan mysteries: that the forces of high divine beings had flown down to the sacrificial altars. But now instead of the forces of the good spirits streaming down, all kinds of demons, emissaries of Lucifer and Ahriman, streamed down to the holy altars. He perceived the fall of pagan spiritual life not by inner enlightenment, as with Judaism, but through external visions. It is very different to get to know things theoretically than to visualize how once divine-spiritual forces flowed down to an altar and now demons did so, which caused abnormal mental states, diseases and so forth. Such spiritual visualization is quite different from knowing something theoretically. But Jesus of Nazareth was to see this in direct spiritual visualization, see how the emissaries of Lucifer and Ahriman worked. He was to see how they did harm to the people. Suddenly he fell down as though dead. Frightened, the people fled. But as he lay there as though carried off to a spiritual world, he received an impression of all the ancient revelations that had once been told to the pagans. Therefore, just as he had perceived the secrets which had been proclaimed to the old prophets and which were now not even a shadow in Jewish culture, through spiritual inspiration he was able to hear in which way they had been proclaimed to the pagans. The strongest impression made on him was what I attempted to investigate, and what I spoke of for the first time on the occasion of the foundation stone laying of our building in Dornach. It could be called The Reverse Our Father, because it was the reverse of the substantial content of the prayer the Christ Jesus' disciples attributed to him. Jesus of Nazareth perceived something like a reverse Our Father, so that he was able to feel in these words the secret of human evolution and incorporations in earthly incarnations in a concentrated format. That is – in stammering words – what expresses something like the laws governing how human beings incarnate from the macro-cosmos into the micro-cosmos. Since I came to know these words, I have found them to be an extraordinarily meaningful meditation form. They exercise a force on the soul which is quite extraordinary, and the more one studies them the more force they have. And then when one tries to resolve and understand them one realizes that in them the secret and destiny of humanity is condensed and how the reversal of the words reveals how the microcosmic Our Father which Christ proclaimed to his followers could originate. But Jesus did not only perceive this secret of the original pagan revelations. When he awoke from the vision, he learned from the fleeing people and the demons the entire secrets of paganism. That was the second immeasurable pain which sank into his soul. First he learned decisively about the fall of Judaism by recognizing what had been revealed to Judaism before its fall. Now he learned the same about paganism. In this way he consciously experienced the fact that in his surroundings the people had to live in the sense of the words: “They have ears but do not hear what the secrets of the cosmos are.” Thus he attained to the unlimited compassion he had always felt for humanity and can be expressed as follows: now that he could see such things, humanity should receive the content of his visions – but where were the beings who would communicate it to humanity. He had these experiences until his twenty-fourth year, approximately. Then his karma led him back home at the time his father died. He lived there with his step-siblings and his foster or stepmother. Whereas his stepmother previously had shown little understanding for him, now she showed more understanding for the great pain he bore within him. Then other experiences followed from his twenty-fourth to his thirtieth year, during which he found ever more understanding from his stepmother, although things were still somewhat difficult. These were also the years in which he came to know the Essenes better. Today I will only indicate the main points of how Jesus learned of the Essene Order. This was an order of men who separated themselves from the rest of humanity and developed a special life of body and soul in order to again ascend to the ancient revelations of the spirit which humanity had lost. With strict exercises and strict ways of life, the striving souls were to reach a stage where they could reunite with the spiritual region from out of which the ancient revelations had originated. In this group Jesus of Nazareth also met John the Baptist, although strictly speaking neither were Essenes. The Akasha Record shows this clearly. But from what I have explained it is clear that an exceptional person was present who made an extraordinary impression on everyone. He so impressed the Essenes that despite guarding their spiritual activities as holy secrets, which they revealed to no outsider, they willingly spoke with Jesus about important secrets of their order concerning what they had achieved for their souls. Thus Jesus learned that in those times there were still ways for people to rise to the heights where humanity once sojourned and from whence it had since descended. But what also made a deep discomforting impression on him was that an Essene, if he wished to ascend to those heights, had to separate himself from humanity and live a life outside the society of others. That was not the way of universal human love, as Jesus of Nazareth felt it. He could not tolerate that a spiritual wealth exist that is unavailable to all, but only to a select few in detriment to humanity as a whole. What he felt can be expressed as follows: They are a few individuals, and there will always be fewer who find their way back to the ancient revelations, but it is just when those few separate themselves that the rest must live in decadence, for they must accomplish the material work for those who are no longer there. Once as he was leaving the Essene Order community he saw in spirit two figures fleeing from the gate. He had the impression that the Essenes protected themselves from these two figures, whom we call Lucifer and Ahriman in anthroposophical terms, driving them away by means of their spiritual exercises, their ascetic way of life and the strict rules of their order. Nothing of Lucifer and Ahriman should touch their souls. Therefore Jesus of Nazareth saw Lucifer and Ahriman fleeing, but he also knew that because of such a community having been established, where Lucifer and Ahriman could not enter and the Essenes wanted nothing to do with them, they turned even more to the other people. That was evident to him. Again it is completely different when one knows this only through theory and when one sees what individuals do for their own advancement and as a consequence Lucifer and Ahriman are sent to other people because they have been expelled from the presence of the former. He realized that it was no path of salvation which the Essenes followed, but was one which through separation and at the cost of the rest of humanity only seeks their own advancement. An immense compassion engulfed him. He felt no joy at the ascension of the Essenes, for he knew that other people must sink lower while a few ascended. It all became clearer to him when he saw the same image at other Essene gates – there were more such communities – the image of Lucifer and Ahriman standing before the gates but unable to enter – and fleeing. Thus he realized that the methods and rules of orders such as the Essenes' impelled Lucifer and Ahriman to the other people. And this was the cause of the third extreme pain he experienced concerning the decadence of humanity. I already mention that his stepmother had more and more understanding for what lived in his soul. So what now happened was meaningful as preparation of the Mystery of Golgotha: a conversation took place – according to research in the Akasha Record – between Jesus of Nazareth and his step or foster-mother. So advanced had her understanding become that he could speak to her about the threefold suffering he endured because of the decadence of humanity which he had experienced in the areas of Judaism and paganism as well as the Essenes. And as he described to her his lonely suffering, and what he had experienced, he saw that it affected her soul. It belongs to the most wonderful impressions one can receive in the occult field to learn the content of this conversation. For in the entire field of human evolution nothing similar – I don't say greater, because naturally the Mystery of Golgotha is greater – but something similar one cannot see. What he said to his mother were not words in the usual sense, but they were like living beings which passed over from him to his stepmother and his soul gave wings to the words with its own force. Everything which he had so painfully endured went in this conversation as though on wings into the soul of his stepmother – words of his infinite love as well as his infinite suffering. So he was able to describe to her what he had thrice experienced as in a great tableau. It was then enhanced when Jesus of Nazareth gradually steered the conversation to his conclusions about the threefold decadence of humanity. When we look back at the evolution of humanity on earth, it is similar to an individual human life, only changed in later generations, and unconscious for them. The Post-Atlantis life of humanity revealed itself to Jesus of Nazareth – that after the great natural disaster in Atlantis, first an ancient Indian culture developed in which the great holy Rishis communicated their vast wisdom to humanity. In other words, it was basically a spiritual culture. Yes, he went on, just as an individual human being is a child between birth and the seventh year, in which different forces are at work than in later life, so spiritual forces were active during that ancient Indian time. But because those forces were not only present until the seventh year, but extended over the Indian's entire life, humanity was in a different stage of evolution then. During the course of their entire life they knew what today the child knows and experiences until its seventh year. Today we think the way we do between the seventh and the fourteenth and the fourteenth and twenty first years because we have lost the childhood forces which are suppressed in the seventh year. During that ancient time, because these forces extended over an entire lifetime, which today are only present until the seventh year, people in the first post-atlantic epoch were clairvoyant. They rose higher with the forces which today are only present until the seventh year. Yes, that was the Golden Age of human evolution. Then came another age, in which the forces extended over the entire life, which otherwise are only active between the seventh and fourteenth years. Then came the third epoch, in which the forces were active which otherwise are active between the fourteenth and twenty-first years. Then we lived in an epoch in which the forces which are active today between the twenty-first and the twenty-eighth years, were active during the entire lifetime. Now we are approaching the middle of human life, Jesus of Nazareth said, which is in the thirties, where the forces of youth cease to grow and begin to decline. We are now living in an age that corresponds to the twenty-eighth to the thirty-fifth year of the individual person, where his life begins to decline. Whereas in the case of some individuals other forces are present, in humanity in general they are no longer there. That is the great suffering, that humanity should become aged, having its youth behind it, being in the epoch corresponding to the twenty-eighth to thirty-fifth year. Where should new forces come from? The forces of youth are exhausted. That is what he told his stepmother about the impending decadence of humanity, which caused him so much pain, for it was clear that humanity's situation was hopeless. The forces of youth were exhausted, humanity now faced old age. The individuals, he knew, would continue to live on from the thirty-fifth year until death as before, because they retained residues of the forces, but humanity as a whole did not have that, so something else must come: what for the individual is necessary from the twenty-eighth to the thirty-fifth year. The earth would have to be illumined macro-cosmically with the forces with which the individual must be illumined from the twenty-eight to the thirty-fifth year. That humanity as such was becoming old, that is what is read in the Akasha Record and felt during what Jesus of Nazareth related. As he spoke in this way to his mother about the meaning of human evolution, at that moment he realized that what he was saying was part of himself, and something of himself flowed from his words, for his words had become what he himself was. That was also the moment when in the soul of his stepmother flowed the soul which had lived in his biological mother who – after the Zarathustra-I crossed over to him from the other Jesus-child – had died and had lived in spiritual regions since Jesus was twelve years old. From then on she could spiritualize the stepmother's soul. Thus the latter now lived with the soul of the Nathan Jesus-child's biological mother. But Jesus of Nazareth had united himself so intensely with the words with which he had expressed his pain about humanity, that it was as if this self had disappeared from his life's [physical, etheric an astral] sheaths, so that these sheaths became as they were when he was a small boy – only impregnated with all he had suffered since his twelfth year. The Zarathustra-I was gone and what lived in his three sheaths was only what remained through the power of the experiences. An impulse arose in these three sheaths which led him on the path to John the Baptist at the River Jordan. As in a kind of dream, which however was not a dream, but an enhanced consciousness, he went his way with only the three sheaths spiritualized and driven by the effects of what he´d experienced since he was twelve years old. The Zarathustra-I was gone. The three sheaths led him on, hardly noticing what was around him. He lived, with the I gone, wholly aware of humanity's destiny and its needs. Those were the words which seemed to come from him. They didn't understand him; they realized that he didn't recognize them, so they asked: “Jesus of Nazareth, don't you know us?” Now even stranger words were spoken. It was as if he had said to them: You are like lost lambs, but I was the shepherd's son from whom you fled. If you recognized me, you would flee anew. It was long ago that you fled from me to the world. Then the mirage also vanished and they stood there dismayed and depressed. When they could again see, they saw that Jesus had gone farther away while they were watching the face. And they could do nothing but be aware that he had gone on. Dispondent, they continued to the Essene hostel and they never told anyone what they had experienced, but kept silent about it their whole lives. And they became the most profound of the Essenes, but they were silent and only spoke when everyday understanding was necessary. Their brother Essenes never knew why they were so changed. Until their deaths they never revealed what they had seen and heard. They therefore experienced the Mystery of Golgotha in a special way. For the others though, what they had experienced was imperceptible. After the despairing man had said this, the being who had appeared in his dream stood again before him, between him and Jesus of Nazareth. This dream figure blocked the figure of Jesus of Nazareth. And when the dream figure left, dissolving in mist, Jesus had also already moved on. When the despairing man looked around he saw Jesus a good distance away. And so he had to continue on his way in despair. These words encouraged the leper to speak in the same way they had affected the desperate man. The leper said: “I don't know how I got this disease, it just came gradually. And other people no longer allowed me to be among them. I had to wander in the wasteland, could only beg for what the people threw to me. One night I came close to a dense forest. I saw a tree approaching me from a clearing. It blinked at me with its own light. I felt impelled to get closer to that tree. It urged me on. And when I was close to it, a skeleton came at me like a light from the tree. It was death standing before me in that form. And death said to me: 'I am you. I live off you. Fear not!´ And it continued: 'Why are you afraid? Didn't you love me during many lives on earth? Only you didn't know that you loved me, because I appeared to you as a beautiful archangel whom you thought you were loving.' And then death was not standing there before me, but the archangel which I had often seen and about whom I knew: That was the image I loved. Then it vanished. The next morning I awoke next to the tree, more miserable than before. And I knew that all the pleasurable indulgences I had loved, which lived in me as egotism, are related to the being who appeared to me as death and as an archangel and who claimed that I loved it and that it was myself. And now I stand before you and I do not know who you are.” And now the archangel appeared again, and then death, standing between the leper and Jesus, blocked the leper's view of Jesus of Nazareth. When the leper saw only the archangel, Jesus vanished, and then death and the archangel vanished. The leper had to continue walking and saw that Jesus of Nazareth had already advanced farther. Those were the events which occurred on the path Jesus took between the conversation with his stepmother and the baptism by John in the Jordan. 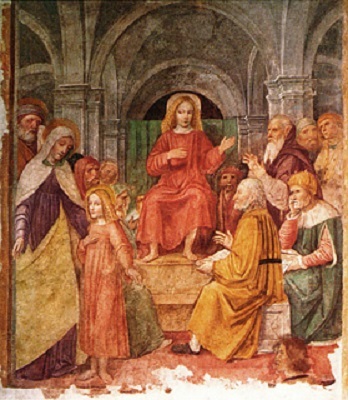 Tomorrow we will see how the these events – the meeting with the two Essenes, with the despairing man and with the leper – continued to affect Jesus of Nazareth's physical, etheric and astral bodies when he barely understood the world from which he was so detached, and were enlivened by what he received with John at the baptism in the Jordan. If these events, which I have described as having taken place between the conversation with his stepmother and the baptism in the Jordan, seem unlikely or strange, then I can only say: Although they may seem strange, they are truly revealed by research in the Akasha Record. They describe events which are as singular as they must be, for they are in preparation for an event which can only happen once – what we call the Mystery of Golgotha. Whoever does not wish to consider the idea that something so special happened at that moment in the evolution of humanity will find human evolution difficult to understand. Editor's/translator's note: In other places, Rudolf Steiner went into more detail about the two Jesus Children. But as his audience here was familiar with the subject, he only gave a kind of resumé. For the interested readers I suggest they compare the birth stories in the Gospels of Matthew and Luke. They will note immediately that the genealogies of the two boys are completely different from King David to Joseph, the father of Jesus. They will also see that in Luke there are shepherds and “no room at the inn” and the famous stable where Jesus was born, and there are no kings or magi. In Matthew the three kings/magi are indeed an important presence. But they do not adore a carpenter's son born in a stable. No, they have come to Bethlehem to salute the new or future King of the Jews. Although Matthew does not describe the birthplace, it is unlikely to be a stable. The flight to Egypt does not occur in Luke, only in Matthew, whose parents had more to fear, living as they were with the future king. Furthermore it is most strange that Jesus the carpenter's son was so well educated that he could teach the rabbis in the temple. Ah, but that was the Jesus according to Luke. The Jesus described by Matthew descended from a royal family and would be in infinitely better condition to do so. Taking all these things, and more, into consideration, it can be considered obvious that there were indeed two Jesus children.